Scott Grimes is back to reprise his role as Brad, but it’s clear he’s matured as an actor and does a great job with the role. Broadway legend Terrence Mann, whom I forgot to mention in my review of the original film, is back as Ug and has the same commanding presence on screen. Same goes for Don Keith Opper who plays the “town drunk turned bounty hunter.” He does a great job on both films. A welcomed addition is Herta Ware [Cocoon, Practical Magic, Species] who plays Brad’s grandma, Nana. She lights up the screen with her soft, magnetic presence. You can’t take your eyes off of her. Really great! As far as the Critters go, they back and badder than ever. They had a bigger budget to work with than they did in the first film and it shows. 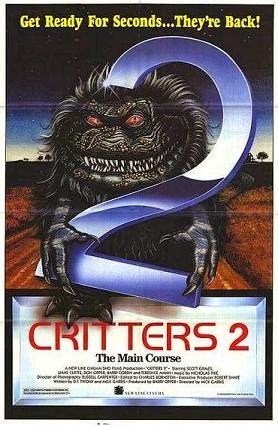 Charles Chiodo and his enormous special effects crew up the ante in Critters 2 and really make the Critters pop. There are great kill scenes and they even manage to make you a little sympathetic to these horrible little creatures when they meet their demise. If you liked the first one, you SO need to see the sequel. Great stuff. Films such as this are what made 80’s horror so fun to watch.